The film opened with Survivor's tune Eye of the Tiger (replacing Bill Conti's recognizable fanfare from previous films), accompanied by the image of two boxing gloves (a stars/stripes American one, and a yellow/red hammer/sickle Communist one) slowly rotating towards each other in close-up, and exploding after colliding. [There was no "scolling" Rocky title logo across the screen.] A flashback presented the final round of the previous film Rocky III (1982), when Rocky Balboa (Sylvester Stallone) fought a rematch against Clubber Lang (Mr. 'T') to regain his title by a knockout in the third round. Under the credits, the flashback ended with Rocky giving his trainer and former boxing opponent Apollo Creed (Carl Weathers) a "favor" - an unofficial sparring to determine who was really the better fighter. There was a freeze-frame of the image when their boxing gloves punched and connected with each other. Rocky drove up to his mansion at night, where he was greeted by his son Rocky, Jr. (Rocky Krakoff), who was videotaping his late arrival home. He was asked about how he had acquired his hat, and his punched-swollen eye, and explained: "A friend gave it to me...Same friend." Inside, Rocky's perturbed brother-in-law Paulie (Burt Young) was awaiting Rocky's arrival to celebrate his birthday. Rocky surprised him by having a life-sized, talking female robot carry in his birthday cake (with his picture on the frosting), although Paulie was disappointed: "Yo, I wanted a sports car for my birthday, not no walking trashcan." Paulie made a wish before blowing out the candles ("I wish I wasn't in this nightmare"), with assistance from Rocky, Jr. wielding a can of Redi-Whip. That same night, Rocky delivered another birthday cake to Adrian in their bedroom - to commemorate their 9th wedding anniversary, although it was still a week away. He gave her a "prize" present -- a gold bracelet-wristwatch, and lovingly reminded her what he had told her long ago: "You're never gettin' rid of me," before he kissed her. The film dissolved to the cover of Sports Illustrated magazine portraying a profile of undefeated, world amateur heavyweight Soviet Union boxing champion Ivan Drago (Dolph Lundgren). An article entitled "SMASH AND SPLASH" told about him and his Olympic double gold-medalist swim champion wife Ludmilla (Brigitte Nielsen, Stallone's real-life wife), who landed in a plane and disembarked at New York's airport. Meanwhile, Apollo Creed was swimming in his L.A. mansion's pool with his playful dogs, while listening to a TV broadcast about "a landmark in sports history" - the arrival of the heavyweight world amateur champion Captain Drago and the announcement by his wife that the Soviet Union had officially entered professional boxing, with Drago's intention to compete as an international sportsman. He was accompanied by his Cuban boxing coach Manuel Vega (James "Cannonball" Green) and Russian trainer-coach Igor Rimsky (George Rogan). One of the Soviet officials, Drago's outspoken manager Nicoli Koloff (Michael Pataki), expressed an interest in setting up an exhibition bout with famous US professional heavyweight champion Rocky Balboa, bragging about Drago's "strength, his endurance or his aggressiveness." The mammoth Drago, with the nickname "The Siberian Express," was an intimidating figure (at 6 foot 4 inches, and 261 pounds). Listening and becoming increasingly angry, Apollo left the pool and telephoned Rocky about immediately returning to Philadelphia from Los Angeles. A demonstration of Drago's "freakish strength" was held at his advanced, high-tech training headquarters, where Koloff bragged about Drago's performance skills, although he was asked by the press about rumors of blood doping and widespread distribution of anabolic steroids. Ludmilla insisted that Drago was "naturally trained," joking: "Like your Popeye, he ate his spinach every day." Koloff added that Drago's punches, thrown at a machine, were measured way above the average heavyweight punch of 700 lbs. of pressure per square inch -- "Drago averages 1,850 pounds...Whatever he hits, he destroys." After a quick dissolve, Apollo had arrived at Rocky's mansion, and at the dinner table was telling him that Drago was strong but a very clumsy fighter: "I know I can beat him." Apollo was interested in fighting Drago, before Rocky did, in an exhibition bout ("It's kids' stuff"). Adrian asked about Apollo's purpose in fighting, worrying that he might be injured after being retired for nearly five years: "What at this point in your life is worth getting hurt for?" Apollo was motivated to prove himself and felt it was the right time, in part, because of his patriotism - to make the Soviets look bad for once, and capitalizing on Rocky's great media coverage. Adrian stressed her disagreement and care for each of them: "Don't you think it's time to start thinking about something else? I mean, how much can you take? Either of you?" Afterwards, Rocky and Apollo watched video footage of their second fight together, when Apollo noted: "It's crazy how people, they just care about you when you're in that ring and they care about you when you're bleeding, but once you step out of that ring, Stallion, it's like you're ancient history." Rocky asked his friend a pointed and truthful question - about whether the proposed fight against the Russian was actually against himself due to aging: "You don't want to believe it, but maybe the show is over." Apollo snapped back: "Man, that's easy for you to say. You're still on top. But what happens when you're not on top. Then what, huh? Where do we go, Stallion? 'Cause we sure as hell can't be born again." He argued that they couldn't change who they really were - fighting warriors -- "And you can forget all this money and stuff you got all around you, man, 'cause it don't change a thing. You and me, we don't even have a choice. See, we're born with a killer instinct that you can't just turn off and on like some radio. We have to be right in the middle of the action 'cause we're the warriors. And without some challenge, without some damn war to fight, then the warrior may as well be dead, Stallion." He then asked Rocky, as his friend, to "stand by my side this one last time." Rocky was persuaded to agree: "All right, but when this is over...," when Apollo finished his thought: "You know me, Stallion, I always think of something else." A press conference in front of an American flag was held to announce and publicize the exhibition bout, tauted as "Red Star vs. Old Glory," "Las Vegas Is the Place for Apollo Creed's Gamble," and "Superman vs. Superhype." Although it began amiably, wise-guy Creed began to jokingly insult the Russian about how he had to teach the young fellow to box "American-style." He continued: "I just want to show the whole world that Russia doesn't have all the best athletes." He went further when Drago hesitated to respond to a question: "The man's tongue didn't come through customs." Ludmilla answered for him, forecasting that former champion Creed would lose: "My husband is very happy to have this opportunity. It's his dream...It could be a good victory." Apollo became incensed and began further threatening Drago and predicting his loss: "Win? You don't really think you gonna whip me, do you?" He quipped to the audience: "I've retired more men than Social Security." Drago's manager Koloff stated that his fighter shouldn't even fight Creed, and accused him of being "far too old" and a "has-been." Apollo lost his cool and a semi-brawl broke out, but the two fighters were separated. Livid and enraged, Apollo abruptly left the press conference with Rocky, snapping at the unfazed and stoic Drago: "We're gonna finish this in the ring...You history, chump, you history!" Apollo then asked Rocky for assurance: "How did I do?" Rocky replied: "A little loud for my taste." "But good?" asked Apollo, with Rocky's assent: "Oh yeah, very good." In Las Vegas ("the city of lights") at the MGM Grand Hotel's Ziegfeld Theatre, the special boxing event was advertised on a bright neon sign, and described as "East meets West, age vs. youth in a goodwill exhibition match." In his dressing room, Rocky cautioned Creed to not wear himself out, since he hadn't fought a match in almost five years. Creed asserted he was in the best shape of his life, stronger and quicker, and he stressed the importance of the fight: "This is not just an exhibition fight that doesn't mean anything. Look, this is us against them." As she approached her seat in the audience, Ludmilla Drago cordially greeted Mrs. Apollo Creed (Sylvia Meals), reminding her that they could be friends afterwards: "They're sportsmen, not soldiers" - and their picture was taken as they shook hands together. The ring was then raised from below the floor to the main stage area, as Drago watched the flamboyant show unfolding around him: a choreographed stage show with dancing show girls, patriotic American flag decorations, fireworks, and a performance by James Brown, the Godfather of Soul, singing Living in America. Drago turned and watched as Apollo was slowly lowered on a platform, wearing an Uncle Sam costume (the same one he wore before his first fight against Rocky in Rocky (1976)) and standing before a giant gold bull-head spewing steam from its nostrils, before joining in the dancing. When the two fighters met in the ring for instructions, Drago said only three words: "You will lose." As the fight began, Apollo (known as "the Dancing Destroyer, the King of Sting, the Count of Monte Fisto...the Master of Disaster" but 40 lbs lighter than his opponent) danced around with his trademark quickness, throwing jabs at Drago, who was waiting with a cocked right hand. But then, Drago unleashed his first punch - a devastating and merciless shot that caught the confident Apollo off-guard, and then followed up with punishing blows to the head and mid-section. At the end of the first round, Apollo was seriously injured and bleeding when brought back to his corner, and the incredibly strong Drago was unphased. The ringside commentators were amazed by the show of Soviet strength - calling it a "pulverizing round" for Creed, although Ludmilla calmly smoked a cigarette, confident of the outcome. Rocky and trainer Duke (Tony Burton) pleaded with Creed to stop the fight ("He's killin' ya! "), but Creed refused: "I'm here to fight. Promise me you're not gonna stop this fight...You don't stop this fight, no matter what!" In round two, Drago further intimidated Creed by standing with his hands down before letting loose with another barrage of punishing punches in the corner ("Creed is being pounded without mercy"). Duke yelled for Rocky to "Throw the damn towel! ", but Rocky honored Apollo's stubborn wish when he shouted out: "No!" And then with one final devastating left hook, Drago connected and Apollo collapsed face-first to the canvas. Pandemonium erupted in the ring and the crowd pressed in, as Drago was announced as the winner. The victor spoke on the microphone: "I cannot be defeated...I defeat all man...Soon, I defeat real champion." And then Drago mercilessly, coldly, and remorselessly commented about Apollo's fatal condition: "If he dies, he dies." Apollo died in Rocky's arms in the ring. Rocky and Drago locked eyes. The scene dissolved to Apollo's funeral, where sunglasses-wearing Rocky delivered a eulogy for his ex-opponent, trainer, and friend: "I guess what matters is what he stood for, what he lived for, and what he died for...I'll never forget you, Apollo. You're the best." At the end of his words and before leaving, he placed his own championship boxing belt (won from Creed in an earlier film) on the flower-adorned grave, although it wasn't buried permanently. Immediately, the rematch was set, with newspaper sports announcements ("Rocky vs. Drago - For Guilt or Glory? - Public Outraged over Apollo's Death"), a cover story in Rolling Stone ("People Protest Against Apollo's Killer," "Public Sees Red Anger Grows," and "Who is Responsible for Apollo's Death? "), a New York Post headline: "Boxing Commission KO's Rocky - Will not sanction fight - "Wait 2 years," a Newsweek story: "Pride or Suicide - Rocky vs. Russian, Rocky Gives Up Title to Avenge Apollo's Death," and a US Magazine story: "Bomb Threats Protest Russian Presence - Russian Wife Fears for Husband's Life." Rocky had given up his title to fight against Drago and avenge Apollo's death, when the Boxing Commission refused to sanction the fight and wanted to wait two years. In another press conference, Drago's manager Koloff asserted that his fighter was the "most perfectly-trained athlete ever" and that Rocky ("this little man") didn't have the size, endurance, or genetics to win: "Drago is a look at the future." Rocky asserted that the fight wasn't about money ("It's not about money") and announced that the fight date had been set for December 25th, Christmas Day 1985, in Drago's home country of Russia - because there were fears for Drago's safety in the US after a number of bomb threats. Ludmilla defended her husband and then turned back to politics: "He's a professional fighter, not a killer. You have this belief that you are better than us. You have this belief that this country is so very good and we are so very bad. You have this belief that you are so fair and we are so very cruel." The Soviets accused the Americans of "lies and false propaganda" as the press conference deteriorated into a shouting match, before they departed. When she returned home, Adrian was swarmed by a crowd of reporters and verbally confronted with questions about the match -- and Rocky's "controversial decision" -- and she responded twice: "I don't know what you're talking about." After Rocky returned home that evening, Adrian asked why he had agreed to fight. He responded that he had made his choice: "I just gotta do what I gotta do," and he expected to leave soon to train in Russia. Adrian asked him to "give it some time," and felt he was risking losing everything. She pleaded with him to reconsider: "Even if you win, what have you won? Apollo's still gone." He snapped back: "I'm a fighter - that's the way I'm made, Adrian...We can't change what we are...All we can do is just go with what we are." She told him he would not win in the suicidal fight: "It's suicide. You've seen him. You know how strong he is. You can't win!" Rocky countered back to her apparent betrayal: "No, maybe I can't win. Maybe the only thing I can do is just take everything he's got. But to beat me, he's gonna have to kill me. And to kill me, he's gonna have to have the heart to stand in front of me. And to do that, he's gotta be willing to die himself. I don't know if he's ready to do that." Rocky left and drove off into the night in his Lamborghini sports car, during the playing of a flashing music video (No Easy Way Out by Robert Tepper), including footage of highlights from all the Rocky films. At the end of the video, he saw himself, instead of Apollo, falling face-first to the canvas before Drago. The next day in his son's bedroom as he said farewell to his pajama-clad boy, Rocky admitted to being "a little scared" before the fight, but that he also had the urge in an actual fight "to go that one more round." He drove off with Paulie (who was asked by the distraught robot before departure: "Did you pack your toothbrush? You know how tobacco stains your teeth" - with Paulie's brash retort: "Hey! Stop busting my chops! "), as Adrian anxiously and sadly watched their departure from an upstairs window. The scene dissolved to their plane's landing in the harsh climate of the Soviet Union - a snowstorm, to the tune of Burning Heart by Survivor. He was also joined by Apollo's manager/trainer Duke, as they were driven to their bleak training quarters, a long distance away - an icy and snowy, remote wilderness cabin ("Like you requested, yes? "), with armed guards stationed both inside and outside, assigned to him as "official chaperones." Paulie immediately complained: "This is below human standards...We'll crack out here." For entertainment, Paulie listened to a CD-device (The Chipmunk Song), while Duke played chess, and then visited with Rocky upstairs (who was adorning his mirror with pictures), reminiscing about Apollo: "When he died, part of me died. But now you're the one. You're the one that's gonna keep his spirit alive. You're the one that's gonna make sure that he didn't die for nothing. Now you're gonna have to go through hell, worse than any nightmare that you ever dreamed. But in the end, I know you'll be the one standing...You know what you gotta do. Do it." The two embraced, as Rocky vowed: "I'll try." In the harsh environment of the Soviet Union, an initial montage displayed Rocky's primitive training regimen -- jogging in the deep snow, sawing logs, heaving boulders, pulling a sleigh (like a pack dog) holding Paulie, exercising with pull-ups, carrying huge tree trunks (Christ imagery), shadow-boxing, and chopping trees. At the same time, in contrast, Drago trained in his ultra-computerized, sanitized facility, where he was constantly monitored by state-of-the-art, high-tech equipment and white-coated lab technicians, and running on a padded indoor track. Unexpectedly, Adrian arrived at the cabin, vowing to be unconditionally supportive of Rocky: "I couldn't stay away anymore. I missed you...I'm with you, no matter what" - and they embraced and kissed. A second montage of Rocky's training (to the tune of Hearts on Fire by John Cafferty) began - now more focused, intense and energized -- shots of Rocky skipping rope, doing extended sit-ups and leg-lifts, chopping wood, lifting heavy rocks on the end of a rope, weight training, etc. Meanwhile, Drago continued to train in his modern facility, increasing his punching power to 2,150 pounds of pressure per square inch, although it was implied that he was receiving injections of anabolic steroids. At the end of his preparations, Rocky climbed up a jagged, snow-covered mountain (eluding his chaperones) where he raised in arms in victory and screamed Drago's name - paralleling his climb up the steps of the Philadelphia Art Museum. Finally, the time for the match in Moscow arrived on Christmas evening, and American commentators on the USA Network announced the fight - "the most watched event in boxing history" - although it was a "non-sanctioned fight" not for the title. Drago was renamed "Death From Above," for his killing of Apollo Creed in the ring. The crowd was emphatically pro-Drago and Soviet Union, and seated in attendance was the General Secretary of the Soviet Union (David Lloyd Austin), a Mikhail Gorbachev look-alike, and most of the Politburo. Rocky kneeled and prayed before the fight. On their way in the stadium toward the ring, Paulie (wrapped in a US flag) apologized to Rocky, and with an uncharacteristic show of affection, gave him a kiss: "If I could just unzip myself and step out and be someone else, I'd want to be you. You're all heart, Rock...Now, blast this guy's teeth out!" In the stadium and ring, Rocky was assaulted by a propagandistic, pro-Soviet ceremony (the reverse of the previous fight), that included fierce booing from a "hostile crowd", while the Russian national champion Drago's name was cheered and chanted. He had to endure the patriotic singing of the Soviet Union's national anthem, as a gargantuan crimson banner of the fighter was raised. Toe-to-toe at the center of the ring just before the "David and Goliath" match, Drago (in red and gold) robotically declared: "I must break you." Paulie rephrased his earlier wish to be Rocky: "Forget it." In round one, Drago offensively attacked immediately, unlike the fight with Apollo, and was unrelenting in his pounding, pulverizing jabs and punches that cornered the smaller Rocky, and then sent him flying 15 feet across the ring to the canvas. The punishing round was an easy win for the taller Drago ("an invincible opponent"), and a hurtful slaughter for Rocky (who was bleeding from a cut above his right eye), regarded as "in serious trouble." In round two of the one-sided fight so far, an angered Rocky ferociously fought off Drago's continued assault, and was knocked down twice, but refused to stay down and bounced right back up. At the end of the second round, one of Rocky's punches cut Drago below his left eye, and the momentum shifted to Rocky. Even after the bell rang, Balboa had to be pulled off his opponent, and the two kept throwing punches. The fighters were split up after Rocky threw Drago to the ground like a wrestler in the "gutter war - no holds barred in Moscow." In Rocky's corner, Duke reminded his fighter: "He's not a machine. He's a man! ", while Drago told his trainers: "He's not human...He is like a piece of iron." The "personal" fight of wills continued through a montage of further rounds, with Rocky showing tremendous endurance as he defended himself (although he was again knocked down in rounds 5, 9, and 11), and was able to deliver bloody blows and body punches, while Drago's confidence and energy slowly decreased, and some of the crowd's cheers were for Rocky's determined stand. By round 12, "suddenly Moscow is pro-Rocky." The commentators noted at the end of round 14: "Lethal punch after punch! Amazing willpower! Neither man backing off," and the hostile crowd was cheering for Rocky. Fearing a loss, Koloff left the Soviet Premier's side and berated Drago's trainer Rimsky: "You trained this fool. He's a disgrace." He then turned to reprimand Drago himself: "Our people cheer for HIM! You idiot! WIN!" Duke reminded Rocky about "no pain" - and that this was his final opportunity: "To win, you've got to knock him out...This is your whole life here." Drago picked up Koloff by the throat, and argued back: "I fight to win! For me!" In the fifteenth round, Rocky's fury erupted, and he dared Drago to fight him with more jabs, as he took further punishment to get inside. Trading punches, the commentator summarized: "It's a question of who wants it most." After a barrage of chopping blows, Drago shockingly went down and Rocky was proclaimed the winner ("Rocky has done the impossible, and these people love it"). Wrapped in the Stars and Stripes flag, the battered Rocky took the microphone and delivered a passionate speech to the crowd, about how their mutual disdain for each other had changed during the course of the fight: "I came here tonight, and I didn't know what to expect. I seen a lot of people hatin' me and I didn't know what to feel about that, so I guess I didn't like you much none either. During this fight, I've seen a lot of changing, the way you's felt about me, and the way I felt about you. In here were two guys killing each other, but I guess that's better than 20 million. So, what I'm trying to say is, that if I can change, and you can change, everybody can change!" The Soviet leader (and his Politburo) had no choice but to stand and applaud the victor along with the entire crowd. Rocky ended the film with a greeting to his son, who had watched the fight on television: "I just want to say one thing to my kid, who should be home sleeping. Merry Christmas, kid! I love you" and an embrace for Adrian before the final freeze-frame. The end credits played, with the reprised tune Hearts on Fire. With a production budget of $31 million, and box-office gross receipts of $128 million (domestic) and $300 million (worldwide). Rocky IV was the highest-grossing film of the entire franchise series (and the most financially successful sports film of all-time), while the most profitable film in the series was the original film in 1976. 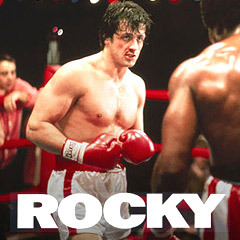 The film was symbolic of the cold war battle between East and West, with blatant Commie-bashing as part of its plot, although Rocky's final victory speech in the ring was a foretaste of easing tensions (glastnost). With numerous Razzie nominations and Awards: 9 nominations and 5 wins -- Worst Actor (Stallone) (win), Worst Director (Stallone) (win), Worst Musical Score (win), Worst New Star (Brigitte Nielsen) (win), and Worst Supporting Actress (Nielsen) (win), also nominations for Worst Picture, Worst Screenplay (Stallone), Worst Supporting Actor (Burt Young), Worst Supporting Actress (Talia Shire).